From running scripts to researching copy, interns help make NPR. This is where we blog about it. As an intern with media relations, I am sometimes asked to transcribe an interview or story. Typically, they are just important or interesting sections that NPR wants to include in press releases that we send to journalists. I had the opportunity to transcribe the interview portions from an amazingly interesting investigative piece by NPR’s National Correspondent Daniel Zwerdling. In the story, which airs today on Morning Edition and All Things Considered, Daniel investigates soldiers who return to Ft. Carson (an army base in Colorado) from Iraq with emotional problems including Post-Traumatic Stress Disorder (PTSD). Now, there have been similar stories about Iraq veterans - as somewhere in the neighborhood of 20 to 25 percent of people who’ve served in Iraq return with serious mental health problems (including depression, substance abuse and PTSD). However, in his investigation, Daniel discovered that not only do soldiers who feel distressed or helpless have a difficult time receiving help but these soldiers are often punished by their superiors and even forced out of the army. I highly recommend listening to this investigation if you have the opportunity. It is both fascinating and unsettling to listen to the stories of these troubled soldiers, the officers who admit to mistreating them and the pattern of Ft. Carson officials forcing these troubled soldiers out of the army without receiving any benefits or treatment. Tune in today on All Things Considered (and, frankly, every day). You can also listen to the story here. 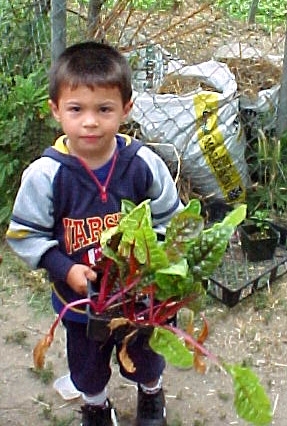 Having just finished our Intern Edition community gardens story, I thought it would be useful to do a beat note. It’s a classic journalism school exercise—to look back at what we accomplished in reporting, what went well and what didn’t. The first thing that occurred to me was the benefit of teamwork. The piece that Clare Abreu and I produced together was far better than we could have done individually. It was astonishing to think how much the story changed focus in the course of reporting, as well. We started with a story about front-yard residential gardens, until we found out that our “expert” has only produced two such gardens. Then, we turned our attention to the loss of the South Central Farm in Los Angeles and the activism surrounding it. But were these stories worth telling? When we visited the Stanford Avalon Community Garden, Clare and I realized our story had to be on South Central’s outgrowths. This was yet to be explored by the media in any depth. At Stanford Avalon in Watts, I was reminded of why I love reporting. The Mexican and Central American immigrant farmers led us into their world. They insisted that we share in their barbeque of carne asada, rice and beans, cactus, salsa and tangy berry juice (even prodding us to go for seconds). Few non-farmers visit them—they were honored to have us. The farmers welcomed us because of trust, too. They saw we were ready to listen and would present them fairly. This mutual respect was crucial. Without their help, there could be no story (or at least not a compelling one). Clare and I were able to interview some major public figures, which was both gratifying and nerve wracking. (I was so intimidated by Edward James Olmos, best known for his role as the teacher in “Stand and Deliver,” that I forgot to turn on the recorder until half way through the interview. We also interviewed Los Angeles Mayor Antonio Villaraigosa at the garden for 30 seconds before he hopped back in his black sports utility vehicle). The most powerful interviews, however, were done with the common farmers at SA and Proyecto Jardin, a small communal garden (without plots). The farmers were laboring for far more than food. I had no idea that their seeds were a connection to ancestors, passed down for generations. And they swore by their medicinal plants, which were grown beneath power lines. As beginning journalists, we still deal with people’s lives and livelihoods. This deserves great respect and responsibility. We visit communities that most of us wouldn’t have the time or access to explore otherwise. It’s a cliché, but we’re life-long students of the world. On Thursday last, I made a resolution. Despite being an unpaid intern living 2,000-plus miles from home and not having even so much as a roommate to keep me company, I resolved that I would do all I could to keep the spirit of the Thanksgiving Holiday. And so began what turned out to be a most singular, and memorable, November afternoon. After consulting my pocketbook, I determined that a conventional turkey dinner with all the holiday trimmings was, while not financially implausible, most definitely an ill-advised use of my rapidly dwindling disposable income. Being unwilling, however, to completely dispense with tradition, I prepared an alternative feast, devoid of turkey and pumpkin pie, but replete with the finest all-white-meat chicken nuggets and capped off by a delectable pumpkin-spice doughnut-a-là-Krispy-Kreme. With King’s portions for all (all being me), none (none being not me) left unsatisfied. And, having satisfied my baser appetites I turned my attention to weightier matters. Having nowhere in particular to spend the rest of the afternoon, it only made sense to spend it somewhere, and, not really knowing what I was getting myself into, I decided that Arlington National Cemetery was as good a place as any. Here my holiday narrative transitions from a light-hearted tenor to a much more somber, even sacred matter. I hesitate to address it, and beg forgiveness if I cannot give due deference within the confines of my allotted word count. Perhaps it was the whimsy with which I decided to make the trip, perhaps it was the fact I made the trip alone, or perhaps it was a natural naiveté, having but little first-hand experience with the institution of war. Whatever the case, I was not prepared for what greeted me as I passed through the gates of what has rightly been deemed “our country’s most sacred shrine.” From the Tomb of the Unknown Soldier to the Eternal Flame, within the precincts of Arlington you will find some of the most moving memorials that men’s minds could conceive of. They are a sight to behold, commanding respect and inspiring patriotism. But the power I felt as I set foot in the cemetery for the first time is not found in those monuments. The true poignancy, the real spirit of Arlington lies elsewhere. It lies in roughly rounded headstones, on gently sloping hillsides, under the watchful eye of the sentinel foliage that whispers with profound gravity “This is holy ground.” Row upon row, in every direction, endless reminders of what it means to live—and die—free. Arlington is more than a shrine to those who died in the service of their country. It is a monument to American perseverance, it is a tribute to the ideal of freedom, and it is testament to the reality of enduring, even eternal truths. It occurred to me, as I walked among those fallen faithful, that American history is more than a cluster of events that can be arranged sequentially, to which we can attach names, numbers, locations, or artifacts. Rather, the history of America is an evolution, an evolution that began long before the founding framers of our country ever put pen to paper to draft any document, long before the first shot of the revolution was fired, long before pilgrims ever set foot on this continent. The history of America is the evolution of an ideal. An ideal with many different names and manifestations—freedom, equality, love, truth. The American ideal is the human ideal. It’s the notion that there’s something bigger than the individual, something worth defending, something worth spreading. It has not been precisely defined, yet, because America itself is still a work in progress. But regardless, it is motivation enough for common people to make all the requisite sacrifices to preserve that ideal until it comes to fruition—and can be enjoyed, in full felicity, by all peoples, everywhere. It is our history, an unfinished narrative, and we, as much as any other, have the opportunity to influence the outcome. And so I felt an overwhelming sense of gratitude, that because of those who have gone before, those of us who are here now, are here, now. Life, Opportunity, Freedom, Faith, Choice, Sacrifice, and American Perseverance. For these things I give thanks. I spend a lot of time combing the shelves of the broadcast library for NPR programs recorded circa 1991. The dates, written in tiny symbols, blur in front of my eyes and I come back 2, 4 and 6 times a day sometimes, when I’ve pulled the wrong CD’s. 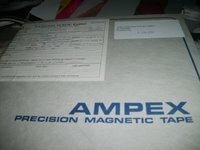 NPR is in the process of transferring their past shows from reels of magnetic tape onto the (hopefully) more stable CD’s. The task seems enormous when you consider that shows were archived on tape as late as the mid-nineties. Every time I went into the library, I’d close my eyes and hope that what I needed would be available in digital format. If it wasn’t I wouldn’t spend triple the time getting a reel, bringing it to an engineer, finding the correct segment (no track markers remember) and finally, digitally uploading it into the network. I only learned to thread the tape into a player myself a few days ago. The task reminded me of being one of the highly lauded AV helpers at my elementary school and negotiating the labyrinthine twists of the classroom projector. Knowing how to do this speeds up the process and annoys the engineers less. Now, I can find the correct place on the tape myself, mark it with special non-sticky paper and hand it to the engineer with less fuss. I stumbled across the more obscure part of this story when I had to order a tape from outside of the building. The audio I needed came from a Morning Edition show from April 1981. Tapes from that year are kept at another site, since the library is small and the archive now spans 30 years. I placed my order and was advised that the time needed to get it to me would include a period of baking. What?! Baking? Yeah, baking. So, here’s what happens. Older tapes, when they’ve sat on the shelf for a number of years, develop an uncomfortable form of tape dermatitis—“sticky shed syndrome.” This means that the tape binder, the glue used to connect the magnetic and plastic parts of the tape, has absorbed water over its long shelf life. This makes the tape stick to the player’s heads and renders it unplayable—or at least the sound quality isn’t great. I did a little research on the topic, talked with a couple librarians and found out some of the back story on this insidious disease. Not all tapes develop sticky shed syndrome. The tapes with the sub-par binder were manufactured in the mid-seventies to late eighties. Why does the tape from those years become sticky, you ask? The answer involves whale blubber. The answer that this article and our friendly NPR library gave is to bake the tape! Yes, literally stick it into an oven. This removes the moisture that’s built up in the binder and makes the tape playable again. Sound easy? Well, there are a couple of catches. 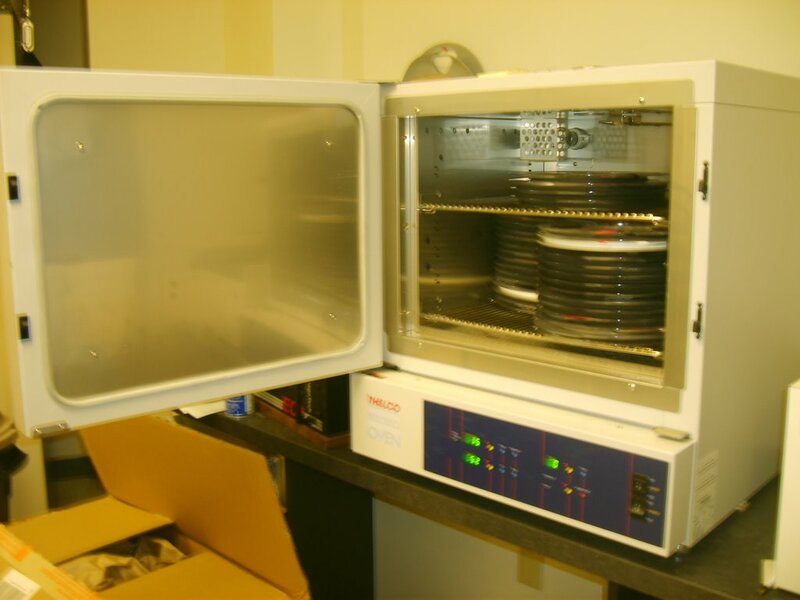 For instance, the tape should be baked at a steady 130° F, which means you need an accurate oven. NPR uses a laboratory oven for the job. And the process takes time—around 4-6 hours. You absolutely can’t use a microwave oven either and the biggest catch is: this doesn’t fix the tape for ever, just a couple months at best. Although this is a fascinating look into the obscure world of audio archiving, for me, knowing this story brings up all sorts of questions about the longevity of information. As one librarian remarked to me, stone tablets are probably the best way of preserving something. They are not, however, easy to store or cost effective. CD’s are cheap and small but they have only been around for 25 years and no one knows what kind of problems they might develop in another 20 (digital psoriasis perhaps?). 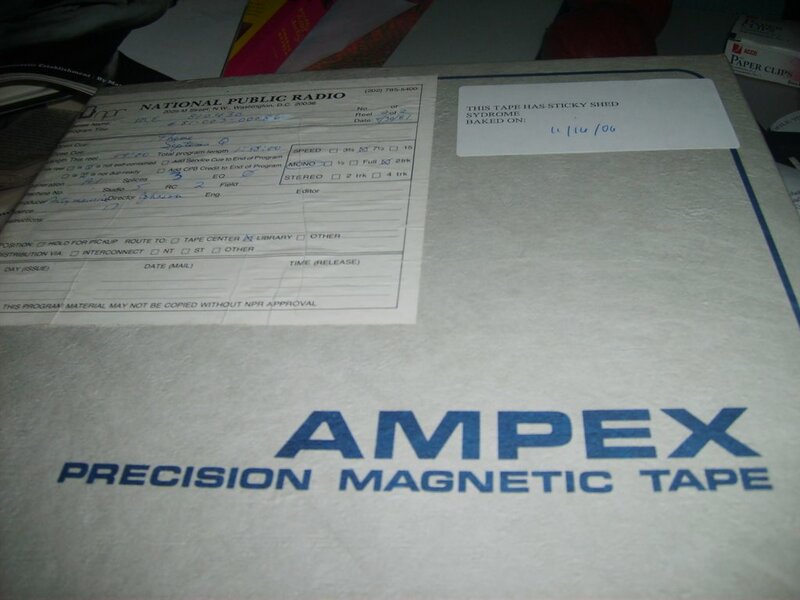 In fact, archivist still prefer magnetic tape as a superior method for audio archiving, with a binder resistant to sticky shed of course. Also, as any computer users knows, the larger problem with archiving media digitally is the frequent failure of electronic storage. Computers crash, hard drives are wiped clean and no amount of baking can bring them back. For information on baking tapes you can go here for all you ever wanted to know and more about creating piping-hot and usable tape. Think you have enough AAI in your life? Think again. Still baffled by NPR-speak or simply hungry for the correct spelling of "ombudsman?" Check out Next Generation Radio's complete guide to public radio lingo for terms, definitions and of course, plenty of acronyms. Search more acronyms at the acronym finder and wikipedia's entry on acronym and initialism. Don't worry: there's a section on fictional espionage organizations. Think that kind of clearinghouse is for amateurs? You're not alone. The Abbreviation Hunts found meanings for every three-letter combination in English, and are at work on a list of four-letter AAI -- abbreviations, acronyms and initialisms, that is. I smiled (a little) and the conversation continued until I reached my stop. That should have been the end of it, and it probably was for my in-transit companion. I, however, couldn’t stop thinking about it, or rather, I couldn’t stop thinking about them—acronyms, that is. Now, before you think “Josh has lost it,” hear me out. NPR (you may know it as National Public Radio), has a virtual lexicon of company-specific terminology. Learning the workplace vocabulary can be a formidable task, just ask any intern. The difficulty of mastering “NPRspeak” is compounded by the fact that approximately 95% of the new terms are, you guessed it, acronyms. Acronyms like ATC, EDL, ENPS, ISDN, ZFLINKERT, (okay I made the last one up, but you get the point). Acronyms are everywhere at NPR. I bet your company is the same. And this acronymo-logical phenomenon isn’t limited to the workplace. We have acronyms for everything. Our nation’s capital is two-thirds acronym (who says “Washington, District of Columbia? Honestly.). Some of the most important organizations, programs, and people in American history are acronyms. FDR, JFK, the UN, the NAACP, the ACLU, the WPA, NAFTA, and the list goes on. By this point you’re probably thinking, “so what?” well, I’m not going to insult your intelligence by imagining that you don’t know how acronyms work, but each one of those letters represents a word, and, more importantly, each of those words represents a concept, ideal, truth, or person. When we forget that, we forget why those acronyms are important. If we don’t know the words behind the letters, we’re more likely to forget the concepts and values those letters stand for. In my book, that’s a dangerous way to live—without values. It’s even worse when the entities behind the acronyms forget what those letters stand for. Perhaps that’s how organizations can come to act in ways that are completely opposite the values they profess to stand for. Perhaps that’s how leaders, lawyers, and lay members of these organizations can fall so far from the original ideal. Perhaps that’s why these organizations can be so intolerant of each other—because they’ve forgotten what it is they stand for. What would the ACLU be without the L? What would the NAACP be without the P? You see, it’s not about the associations; it’s about the people. It’s about their liberties. And I’m worried that we’re forgetting. In the big picture, does it really matter that ENPS stands for Electronic News Production System? Probably not. But does it matter that UN stands for United Nations? I think it does. 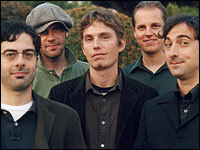 My pick this week is the Seattle band Central Services. Their music ranges from laid-back indie pop to a harder, alternative rock sound. I liked the band because of the layers in their songs. As well as a tight main melody, the music usually includes counter-melodies and variations in texture. The song I picked, “Get to You,” is one of their more rocking tracks. The band stars songwriters Kevin Emerson on vocals and stand-up drums, Jeff Blancato on lead guitar, keyboardist Eric Goetz, bassist Mark Livingston and rhythm guitarist Ethan Jones. Emerson and Jones play together in another indie pop band, The Math and Physics Club, who recently released a full-length album with Matinee Records. For those who couldn't join us for our recent 2006 conference, and those who want a second helping, we've just posted all of the panels and breakouts for your edification and pleasure. Words of audio wisdom from the likes of Nancy Updike, Joe Richman, Rob Rosenthal, Daniel Zwerdling and Marilyn Pittman are just a click away. Maybe it was the incessant jabs from co-workers, maybe it was working the all-night election coverage, or maybe it was spending Veterans Day in Washington. Whatever the case, I’ve had America on my mind a lot lately. Now, I don’t have a Ph.D. in American history (I have a B.A. in English), and I haven’t read much of Sam Johnson, Thomas Jefferson, or any other political thinker. I wasn’t raised on C-SPAN, and I only subscribe to one newspaper. I don’t know the name of every representative in congress (though I do know the name of mine) and I can’t sing my state song from memory. There is a lot more that I don’t know about politics than I do. Indeed, I may not be the most “informed” American, but I can tell you this much—I am just as American as the most “informed” among us. If I understand the constitution correctly, that means my opinion is no less or more important than the next American’s. It simply is what it is, and that is the beauty of it. It also occurs to me that being American means, among other things, that while I may never rise to prominence and I might never amass personal fortune, I have just as much responsibility for the fate of this nation as those who do. I have as much of an opportunity to speak out, and speak up for what I believe in, as anyone else. That’s the power of a vote. This past week Americans in all 50 states spoke, and the resultant change was substantial. Was the desire for change unanimous? The close margins of victory in several races leave that question open to debate, but one thing is certain—the system still works. The key to a successful nation is an active, involved citizenry. Americans called for change, and they got it. To everyone who exercised his or her right to vote I say thank you for speaking up, offer this reminder: just because the election is over, doesn’t mean you should cease to be heard. I’m quickly running out of column inches, and I could go on and on about what it means to be American, but I will end, for now, with this (and what I’m about to say applies across party lines): Call me naïve, but I believe America is made up of people not that different from myself, and I believe the overwhelming majority of those people are good at heart. I believe most of us have the same goals, and we honestly want what we believe is best for our country. I think we witnessed that last Tuesday, and while I don’t completely agree with the outcome, I’m okay with it because that’s the way America works. I’ve had America on my mind a lot lately, and I think we’re gonna be okay. What caught our eyes and ears in print, radio, visual and online media.